Welcome to some Cutting Cafe Inspiration! 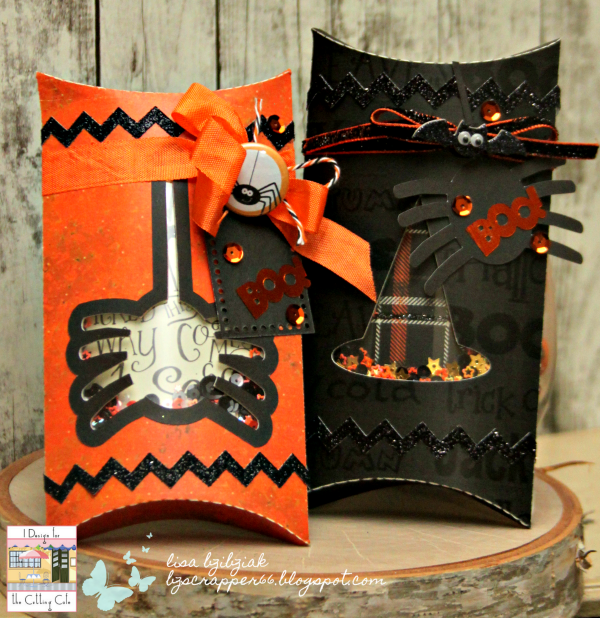 This time around we're playing with Pillow Boxes of the Halloween sort! We were also lucky to get to play with some Digital Papers from Tabitha Skagg's CuteNCraftyMommy Shop on Etsy! Tabitha is one of our new teamies and a big welcome to her, K M Meena Herale, Kim Hodgson, Justine Dandrea, and returning to our crafty family, Donna Espiritu! Lots of new places to visit! Edited to ad this (Woo hoo)! So usually when you put these together, you'd pull them off of your cutting machine, place a piece of acetate over the window on the inside of the box, and then fold it up and glue it together! All I did differently was add some foam tape around the hat and spider, a few sequins on top of the window, and then attached a piece of design paper to that, choosing which side I wanted to have show through the window (well, of course I chose the plaid... this yummy paper is from Authentique and I got mine in the Cutting Cafe Shop here... thinking I might need to get another 6x6 pad! I felt like this one needed an outline so that his many many legs would stand out... love the way it looks. This shaker doesn't shake as much because the wide window is a bit more curved than the hat so it makes it tighter... but it shakes! And you may have noticed I used the inside cut from the spider outline as an embellishment on my witch hat pillow box! This beautiful distressed orange paper is also from the digital set and was just what I needed! I wanted something not too busy, but still with a little bit of interest. 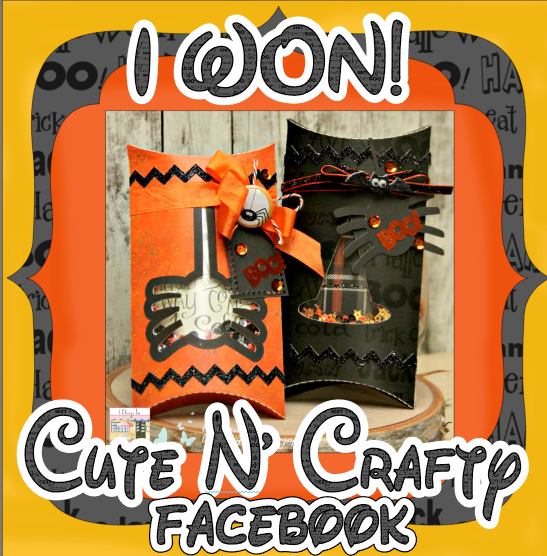 And there is an October challenge over on the Cute N Crafty Challenges Group and I'm adding this one to that Challenge! 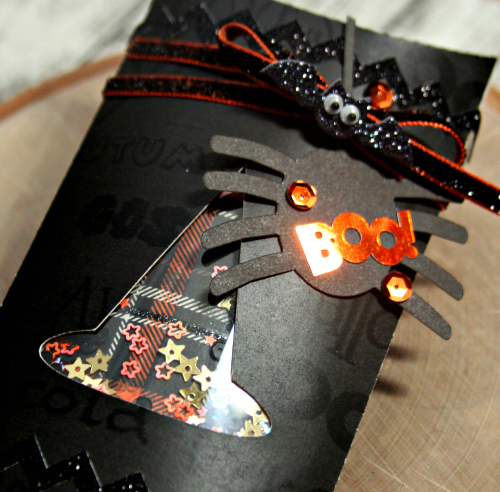 For most of my embellishments I just pulled out my box of crafty Halloween goodies and went to town! I'm linking up to the current Double Trouble and Crafter's Cafe Challenges... they are partnering this time around and both are Black/White and one Additional Color! So thanks for stopping! 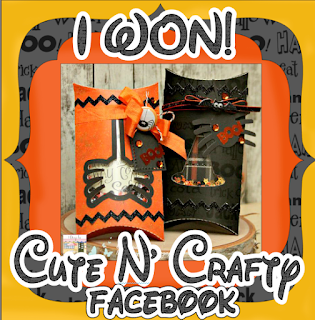 Be Sure to head on over to the Cutting Cafe Blog... comment there for a chance to win three files of your choice and then see what everyone else has created for you today! And be sure to leave some extra love for our new teamies! Be sure to come back on Tuesday for something special! These are ADORABLE!!!!! I loveeeeeeee the Halloween goodies!!!!!! 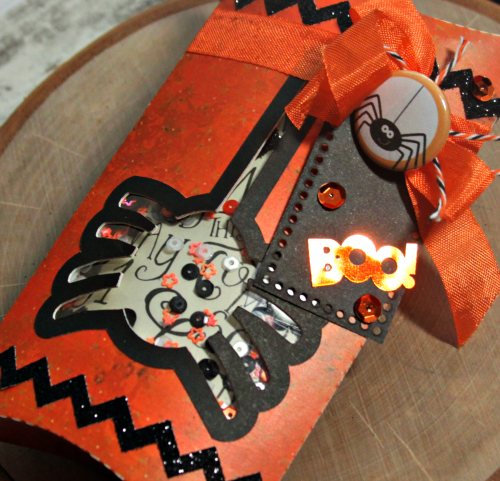 Super fun Halloween gift boxes. CAS-ual Fridays Release Day 1 - Big Hope Fri-Die! Polka Dot Orchard-Coffee Pumpkin Flourish! Caffeine Fueled Paper Play - Reverse Confetti! The Cutting Cafe Inspiration- Anything Goes! Paper Sweeties October 2018 Release Rewind! Paper Sweeties October 2018 Release Party! Caffeine Fueled Paper Play - The Cat's Pajamas! A Day Filled With Happy with CAS-ual Fridays! Caffeine Fueled Paper Play - Newton's Nook!